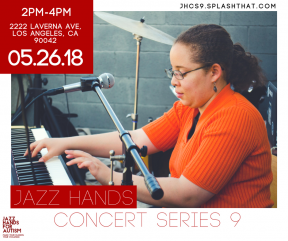 LOS ANGELES - May 8, 2018 - PRLog -- Jazz Hands for Autism celebrates "Exceptional Sounds by Exceptional People" at their upcoming concert event on Saturday, May 26th at the Greater Los Angeles Agency on Deafness at 2222 Laverna Ave, Los Angeles, CA 90041. The free event celebrates Jazz Hands for Autism's 4th anniversary which features a concert from 2PM to 4PM with a reception from 4PM to 5PM. The concert features vocalists, instrumentalists and rappers, all of whom are on the autism spectrum. And don't let the name Jazz Hands fool you; music genres represented at the concert range from pop to rock to rap and, of course, to jazz. "There is something wonderful that happens when you create an opportunity for groups of people who may usually have little interface to come together through music," explains Ifunanya Nweke, Executive Director and founder of Jazz Hands for Autism, a non-profit that focuses on musical opportunities for adults with autism in the metro Los Angeles area. "The concert is special because it provides a place where individuals on the autism spectrum can be celebrated for their gifts and talents." Out of her love of her love for music and her experience working with ASD students in public education, Nweke created Jazz Hands for Autism (JHFA) four years ago as a local non-profit designed to foster and promote the musical abilities of ASD adults. What started out as a concert has grown to be a vibrant multi-faceted program that includes a vocational academy designed to train, mentor and prepare musically talented ASD individuals for work in the music industry. For those interested in JHFA, the upcoming concert is a great way to learn more about their programs. The U.S. Centers for Disease Control and Prevention (CDC) reports that 1 in 68 school-age children are on the autism spectrum with the condition being much more prevalent in boys (1 in 42 boys in contrast to 1 in 189 girls). Autism Spectrum Disorder (ASD) is a complex developmental disability that typically affects a person's ability to communicate and socially interact with others although there are many other symptoms and characteristics that can vary for each individual. While ASD affects each person differently by providing challenges from mild to severe, many individuals often exhibit expertise in a specific area of interest and/or strengths in creativity, art or music. Historians believe that famous composer Wolfgang Amadeus Mozart was on the spectrum while 10th season American Idol finalist James Durbin has talked openly about his autism. Nweke hopes that JHFA will one day provide the next American Idol; she is the biggest cheerleader and fan of all her musicians. Just like the spectrum, Jazz Hands participants having a wide range of skill and musicality. She encourages the community to come out to the concert and celebrate the talent and hard work of some very special musical artists. Nweke adds, "It's free, it's family oriented, and it's fun." Interested in attending the concert? Save the date and RSVP at JHCS9.Splashthat.com although Nweke is quick to note that a reservation is not needed in order to attend. About Jazz Hands For Autism: Jazz Hands For Autism (JHFA) is a section 501(c)(3) nonprofit talent advocacy group that is creating pathways from expression to employment for musicians on the autism spectrum. Founded in 2014, JHFA provides platforms for career exploration, socialization and confidence building in addition to musician focused vocational training and job placement in music related positions. For more information visit http://jazzhandsforautism.org/ or email at Info@jazzhandsforautism.org.